Merritts offer numerous options when it comes to Versa-Lift technology. With our Versa-Lift hire service you are also supplied with a fully trained and experienced operative. We operate throughout the whole of the UK and will deliver the required Versa-Lift to your desired destination. Our largest Versa-Lift is capable of lifting up to 45,000 kgs and we even have electric versions which are perfect for use in sensitive environments where noise and pollution is an important consideration. 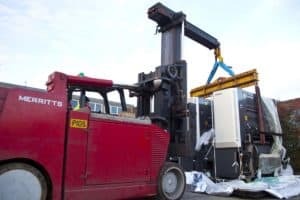 We use Versa-Lifts on a daily basis, with jobs ranging from single machine moves to larger projects including internal machinery relocations and complete factory removals. All of our Versa-Lifts are regularly serviced and certified to meet all Health and Safety regulations. – Frame extends 1,220mm to increase the capacity to 35.9 tonnes. – Boom removed in minutes with special boom stand. – 3 section hydraulic boom telescopes to 8,180mm high. – Powered by clean LP Gas engine. – 18 tonne capacity at 915mm load centre with a 2,490 wheelbase. – Frame extends 1,220mm to increase the capacity to 27 tonnes. – 3 section hydraulic boom telescopes to 7,925mm high. - 1,520mm wide. with an 1830mm wheelbase. – Frame extends 915mm to pick up 15,880kg at 610mm load centre. – 3 section hydraulic boom telescopes to 6,700mm high.